The blue water, and blue and yellow background on this purse were painted with acrylic latex craft paints. 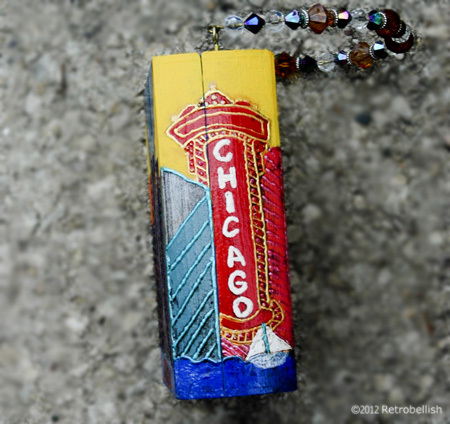 Once the paint dried, we used fabric craft paints to paint the abstract Chicago scene. About an hour after everything dried, we used clear latex acrylic sealer to seal it. The purse handle was a pre-made handle reclaimed from a previously scrapped project. Cigar boxes make a great craft project to make at home with children and friends. These boxes could also be found at any big box craft store alongside other shaped boxes and paper mache boxes. So just have fun and create your own piece of art. This small collage started out with a shoe box full of ad booklets from a VHS movie club I had joined so many years ago. Every month, the movie club would send me an envelope full of ad booklets that were so beautiful and filled with so many thumbnail photos of popular movies, shows and movie stars. From time to time, I’d cut out my favorite pictures before recycling the rest of the booklets. A while back, I was going through my shoebox and the picture cutouts still looked so beautiful that I decided to make a collage. I noticed that I had more cutouts of male actors than of any other picture cutouts, so I decided to make the actors my theme. I laid out the pictures on a table and went in search of a board to use as a base. I found a small clean leftover piece of drywall in the basement, which had an interesting rectangular shape so I used the drywall as my base. I used Mod Podge to glue on the picture cutouts and really loved the way the collage started to look as I finished each section. After finishing the collage, I liked it so much that I asked my husband to frame it for me using a frame I had leftover from another project. It turned out to be a very nice piece and although I made this project a while ago, I wanted to post it here to show how simple and fun it can be to make a project from recycled items. And although I used a wood frame, you can use anything to frame out the collage or even no frame at all by leaving a border around the collage that you can paint using any craft paints. A fun and great part of the project was collecting the pictures and cutting them out, so this could also be a great family project to do with your children or at school using favorite characters that you and your children love. Sometimes we have clothing items that we’ve outgrown or have fallen out of love with or maybe it’s just lacking a little pizazz! Whatever the reason, I’ve found that what always works for me is to take out all of my colorful beads and set them out on a piece of fabric on the dinning room table. I then study all of the beautiful colors of the sparkling beads next to that article of clothing and it’s easy to imagine them already sewn on and make the final decision. The beads I used on this embroidered deep pink blouse are not necessarily the most traditionally used style of beads, but rather what I thought would give the blouse an accent and subtle sparkle without taking away the focus from the beautiful embroidery on this blouse. After I sewed the crystal beads on the blouse, I realized I had leftover quite a few deep pink crystal beads and decided to make a set of matching earrings. A very long time ago, I had dabbled in making earrings because I couldn’t find the style of drop pearl earrings to match my wedding dress. I had bought earring findings–packets of head pins, eye pins, jump rings, earring hooks, faux pearls and jewelry pliers to make my drop pearl earrings. I was very happy with the outcome of my loop pearl earrings and saved all of the leftover pieces. I dug around and found the small box containing those findings that I needed to make matching earrings for this deep pink blouse. 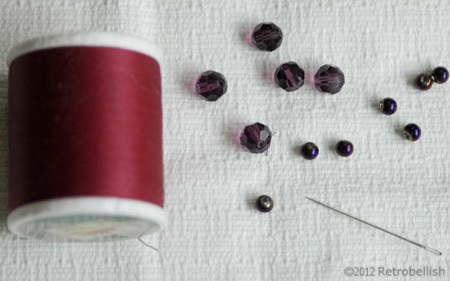 Giving used clothing a beaded look could be very rewarding and depending on the size of the beads, not too tedious. You can use larger special types of beads as an accent on the blouse especially if the article of clothing already has beautiful embroidery or an interesting pattern. 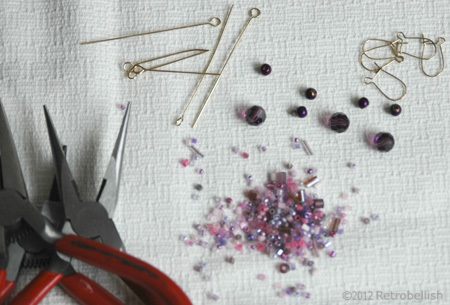 Beading can be used as an accent rather than the focus of any piece. So don’t be afraid to try out new projects with items of clothing that could use Just a little of your creative touch. Thank You for your visit!